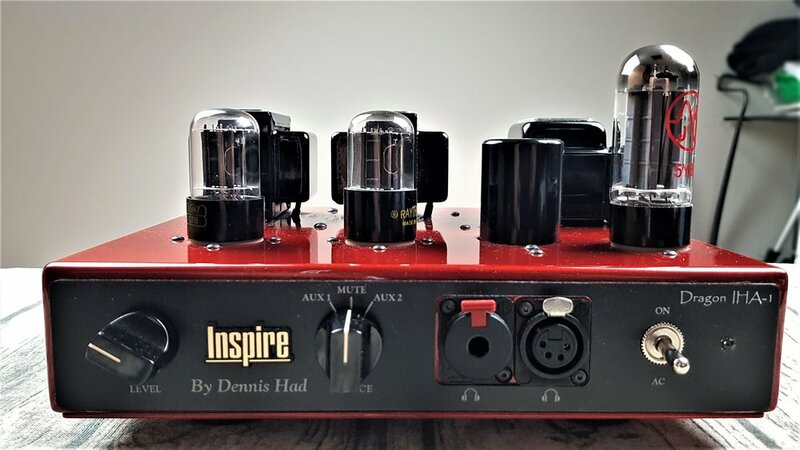 The IHA-1 is the concoction of Dennis Had, formerly of Cary Audio, who has a reputation in the audio community for his tube power amps. After Drew Baird, CEO of Moon Audio, used an Audeze LCD-3 to showcase to Dennis just how far headphone technology had come, he decided to give a commercial headphone amplifier a go – distributed by Moon Audio exclusively. 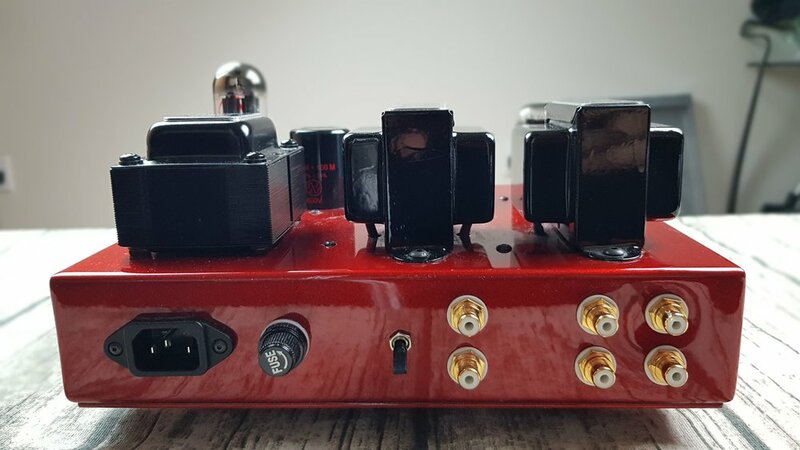 He also sells his other amps on eBay separately, but I have no experience with those. 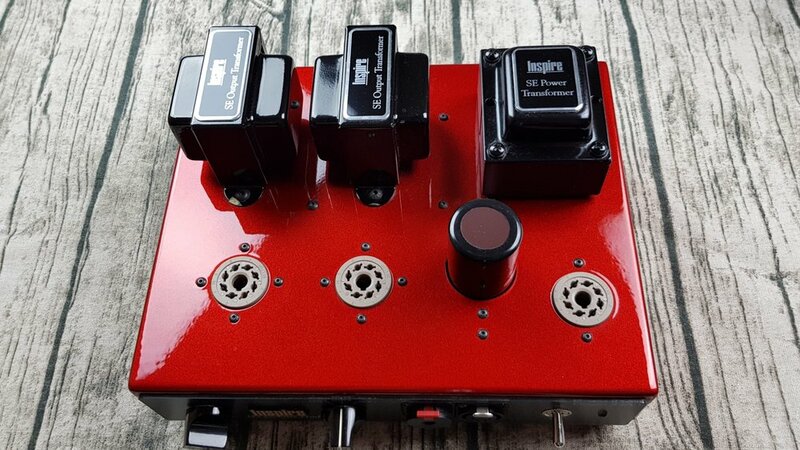 Essentially, the IHA-1 was Dennis taking elements from his years of designing highly-regarded tube speaker amps and distilling them down to something that could be enjoyed with headphones. I received mine on the 9th of August, 2017. It was a personal purchase, done purely out of curiousity as several of my peers had one and liked it considerably. Based in the United Kingdom, I wasn’t able to demo it anywhere as it is sold exclusively by Moon Audio – who are based in North Carolina, USA. I did meet Drew at the 2016 London Can Jam however, where I listened to the Focal Elear and Utopia out of this amp. At the time, I had no reference point for what I was hearing – all I knew was that it was really, really good. Over the next few months, I found myself with an Elear and then eventually a Utopia – but I wanted to know more about that amplifier with which I had first experienced these headphones. After filming an unboxing video, I was pleased to hear that the amp immediately sounded like a considerable upgrade over my other options at the time – with the stock tubes. 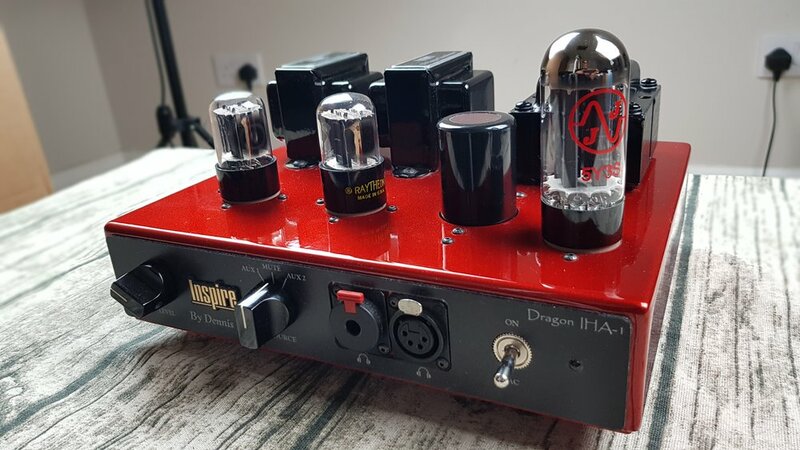 I fell into a downward spiral of tube exploration based on expensive curiousity over the next few months – culminating in me buying one of the most sought after rectifiers out there for it. After that, I retreated and worked with what I had. Ten months after purchasing it, I’m ready to present my findings. · Direct coupling and transformer output are included as part of the standard configuration. · 10 inches wide 8 inches deep, height varies based on tubes used. For the younger members in the community, particularly those who have dabbled in audio production, the look of the IHA-1 will probably remind them of the Focusrite Scarlett series due to the deep red colour. Others will notice that the tube glow is quite dim on this amp, the Feliks Elise lit up the same pre-amp tubes far more – as far as aesthetics go. The compactness of the IHA-1 surprised me, as I had forgotten the exact size in the year since Canjam London 2016. After shopping around and seeing amps with so, so many tubes plugged in – the IHA-1 seemed quite approachable with its two pre-amp and single rectifier design. When it comes to build quality, it is quite solid -although I noticed one day that a small piece of plastic had chipped off at some point. It should be noted that this amplifier is not balanced. It is single-ended, despite the 4-pin XLR output on the front existing. Also, rather interestingly, there is no volume or sound degradation if both the XLR and ¼ inch outputs are used simultaneously. Two sets of single-ended inputs exist in the back, with a front dial allowing you to switch between the two and putting the amp on standby mode – cutting off any sound. The volume dial is on a stepped attenuator, and I usually never really go beyond the 12 ‘o clock mark. However, I have heard of people saying this amp (even with the Lundahl transformers) isn’t loud enough for them entirely. That boggles my mind a bit. The Lundahl transformers are an upgrade I opted for, costing $250 more than the fully stock IHA-1. To my knowledge, these don’t add more wattage to headphones – but rather more clean gain. I find this essential if you are planning on using planar magnetic headphones with this amplifier. I also opted to get the pre-outs in the back added for an additional $100, as this was an option back then but has since been made mandatory and had its cost added to the baseline price. These had significant hum when used with my active speakers, and nothing I tried could eliminate that. I surmised that they were designed for passive systems and stopped using them. At the time I purchased it, the stock tubes were a pair of NOS Raytheon 6SN7s alongside a JJ 5Y3GT – with upgrade options being a pair of Sylvania 6SN7 GTA or GTB pre-amp tubes alongside a RCA 5U4GB. These have since been changed, as you can see in the specifications list – and I assume Moon rotates according to availability. The IHA-1’s main strength, if you share my obsessive inclinations in hobbies, is a double-edged sword. It simply morphs with the tubes you plug in, and is a very capable blank canvas in doing so. On one hand, I have no doubt that a large number of users will be perfectly happy with the stock tubes, but I also do not doubt that others will find the payoff from trying different tube pairings to be quite substantial – as the differences are not subtle. The sound of the amp itself is also very much to my liking. I’ve tried a variety of sources with it and felt that it did not stretch nor narrow the soundstage in any way by itself. Its own tendencies are geared towards detail retrieval and trying to remove itself from the chain as much as possible. It’s because of this that I’ve found it (with a tube pairing that I am familiar with) an easy amp to evaluate source gear with. The bass amount might, however, be a detraction for some people - particularly those who are used to certain solid-state offerings with elevated punch. I don’t find the IHA-1 thin or unsatisfying at all, and with certain tubes it is far from that – according to my preferences. But, I will admit, it’s a bit leaner than the aforementioned solid-state amps. It’s interesting because I had heard through the grapevine that the IHA-1 was an amp that was very similar to a solid-state in sound despite injecting the benefits of tubes as well – but the bass immediately gives it away if you are someone who is used to a lot of slam. The midrange is remarkably transparent and clean sounding, with no emphasis in lower or upper registers. The former is something I heard with the Feliks Audio Elise, and when I reviewed it last year I pointed out this tonal difference with the IHA-1. That being said, if a slightly warmer and more euphonic experience is something you desire from your tube amp – you can always swap in some tubes to cater to your needs (and I’ll detail some pairings below you might want to check out). I, personally, prefer a more even ascent up the frequency spectrum with the IHA-1 – so I did swap out the stock Raytheon 6SN7 pre-amp tubes, although I find them very capable and a good stock option on Moon Audio’s part. While I would not characterise the IHA-1 as a bright amp, I would again mention that this isn’t a warm and gooey experience that some enjoy tube amps for. It can be taken there, but it will never quite go all the way. The treble is delicately balanced yet has the ability to soar, and does not seem etched with the majority of the tube pairings I have tried. It also doesn’t become too rolled with others, changing just enough without removing an important aspect of the listening experience. Now that I’ve attempted to explain the tonality of the amp, I’d like to mention that what I enjoy the IHA-1 mostly for is its ability to bring out more detail in tracks. Not to be dramatic, but I heard this even the first time I plugged it in with the stock tubes. Even today, writing this almost a year later – I’m hearing the same benefits from the stock tubes even though I haven’t used them in almost as long as I’ve had this amp. Track separation is very well done, depending on source, with the stereotypical “hearing things I didn’t hear before” in full effect if it is a significant upgrade to your source chain. Paired with a Schiit Yggdrasil and driving a Focal Utopia, I often find myself in the position that music I’ve listened to for a long, long time (predating my involvement in this hobby) makes another shift in how I hear it. More is exposed, and it’s a struggle (for some) to not chase further than the stock tubes to enhance this ability. I understand why this was included in my set as a stock pre-amp tube option. These manage to display the capabilities of the IHA-1 sufficiently while retaining a bit of the stereotypical tube warmth that some expect. I’ll admit that the sweetness in the midrange is quite compelling with this pair and could be a reason why someone would return to it after an upgrade. Disadvantages are that it can, compared to better offerings, mask detail a bit and that it’s quite laid back. These are possibly available from Moon Audio to add to the IHA-1 order for an extra $100. My favourite 6SN7 option, the Sylvanias veer towards the brighter side of things but have very well-controlled bass alongside sparkling and detailed highs. The midrange isn’t as lush as the Raytheon 6SN7, but has more texture to my ears. Be cautious when pairing with bright rectifiers such as the RCA 5R4GY, as it might be too much treble for some. Warmer than the Raytheons and even more masking of detail, the main reason for using the Ken Rads is the bass slam injection. Fuller in the lows, these tubes are punchy and quite good for EDM and other electronic genres – but not something I would want for jazz or classical. Interestingly, Drew told me that they had made revisions to the amp that made it no longer support this tube set, despite me reading somewhere that it was Dennis Had’s favourite for the IHA-1. Simply put, they work in my unit at least. Considerably lower in output than the 6SN7, the 6BX7 has what I can only call a more mature warmth to it than the Ken Rads and Raytheons. It’s somewhere between them and the more articulate Sylvanias. However, you will need to crank the volume on the amp even further to volume match these, and there is a slightly higher noise floor than the 6SN7s. The major failing of this rectifier is in its sub-bass control. This wasn’t quite apparent with headphones that don’t dig down as deep, but when you do plug in one that does – it’s very noticeable. Flabby and sluggish, these will slow down punchiness in such headphones and be an unsatisfying listen. I recommend replacing them even if you don’t use headphones with well-extended lows. The cheapest replacement for the stock JJ that I can think of. A mere $15 on eBay will gain you a considerable upgrade in lower-bass control. Overall sound is leaner than the JJ and not very euphonic at all. To my understanding, these are current production tubes made in Russia. I find them quite capable, but far from my favourite pairing for the IHA-1. These are current production tubes based on the legendary Mullard black-base tubes made in Blackburn way back in the day. The difference is that these are made in Russia by, allegedly, Electro-Harmonix – who purchased the original machinery from the UK factory. Considerably cheaper than the original tubes, I had hopes that these would match them. However, that wasn’t the case. These sound more like the Electro-Harmonix 5U4GB than original Mullard GZ34 black-base tubes. Lean and a bit etched in the treble, these do not sound stereotypically “tubey” at all. Detail retrieval and bass control is similar to the cheaper Electro-Harmonix 5U4GB as well. A headscratcher, this one. The black-base GZ34 can be found for anywhere between $50-100 and beyond. These are warmer than their reissues, but have a more organic sound that will immediately be appreciated by those chasing “tube” characteristics. They also have ample bass compared to the re-issues, that were a bit lean throughout. Treble is a bit rolled, however, and detail retrieval is more or less equal to 5U4GB variants. Staging is a bit narrow too. Despite the aforementioned “organic” sound, these are possibly some of the most solid-state sounding options you can grab for the IHA-1 due to their very focused presentation that does away with any slightly “romantic” diffuse/ethereal sound that some might expect from tubes. By far the most I’ve spent on tubes, the metal-base GZ34 earns its reputation due to its incredible melding of detail retrieval with a focused sound that somehow still retains a slight etherealness to its signature that makes some genres very satisfying to listen to. There is a slight lingering to the decay, which is an addition to the IHA-1 which doesn’t have such a characteristic by its own nature, that is very romantic sounding without overstaying its welcome. It’s very delicate and effective. I wouldn’t recommend it for its bass capabilities however, as it is quite lean in that area. The midrange is the highlight, as detail is presented effortlessly alongside texture. What sets this apart further over the aforementioned rectifiers is its timbre, as it takes the ability of the Schiit Yggdrasil Analogue Stage 2 to recreate live acoustic instruments and takes it a step further – especially pianos. Furthermore, it does all of this in a non-fatiguing way as the treble is not harsh nor hiked. In fact, I’d go so far to say that it’s ever so slightly rolled off in the high treble (especially compared to the likes of the RCA 5R4GY) – but it doesn’t bother me due to all the other benefits it brings. Do I recommend it? Yeah, but you’d have to be insane to buy it for its current market price – and I seemingly am. These were available to add to your IHA-1 order for an extra $100 – although their market price is lower than that. A considerable jump from the stock JJ 5Y3, the RCA 5U is a warm tube with a bit of bloom for those who desire it. Its bass control is also a substantial upgrade over the stock option. Its strength is a musical sound, but it lacks some detail retrieval and resolve compared to other options – if such attributes are important to you. My favourite of the warmer, bassier rectifier options, the Westinghouse sounds like an upgraded RCA 5U4GB with more resolve to it. Its bass managed to balance being ample and well controlled to a level that all these other rectifiers simply do not – as they veer towards being lean and controlled or ample and bloomy usually compared. What I like furthermore is a bit more sparkle in the treble that helps this be a great all-rounder tube, more so than the metal base GZ34 even and great value if you can get it for $50 or less. This goes neck-to-neck with the metal base GZ34 in terms of detail retrieval, beats it easily in staging width – but loses out in timbre. The Brimar is lean in the bass and a bit rolled in the treble, but it has stellar detail reproduction. While I do like it overall, the problem lies in its timbre being off for several instruments – making them sound a bit muted and not letting them soar quite as much as they need to. That being said, these probably have the most upper-midrange emphasis out of all the rectifiers detailed in this article. Strings have considerable air to them, but the treble is where drawbacks begin. Also, the lower midrange is a bit scooped – which can slightly hamper male vocals and guitars, areas where the 5U4GBs are better. I have parted with this tube as I wasn’t using it much, but its detail retrieval and instrument separation made it a tough sale for me regardless. Cheaper than the Brimar 5R4 variant, the RCA has the most treble sparkle of any tube detailed today. Well-extended highs and more representation in the lower-midrange makes this the clear winner of its counterpart – in my opinion. That being said, it takes a small hit in detail retrieval and track separation – and the staging width is narrower, although still wider than the other rectifiers. If you had to pick any two rectifiers from this list today to cover your bases, with a max budget of $100 for both, I would say the RCA 5R4GY and the Westinghouse 5U4G would serve you well. This amplifier is my second-favourite audio purchase of 2017, it’s really about as simple as that. Ten months down the road and my opinion of it hasn’t dampened. Any disappointments I may have had in the early days, such as the hum in the pre-amp section, have faded as I doubled down on its best usage – driving dynamic-driver headphones paired with my Schiit Yggdrasil. I found my favourite tube pairings and have familiarised myself with them over time. Despite the praise I see online for this amplifier, I still feel that it is slightly underrated in the audio community as a whole. The Head-fi thread pales in size compared to the popular and cheaper Feliks Elise and the far more ubiquitous Schiit offerings. I don’t know if this lack of marketing push is intentional on the part of Drew and Moon Audio, perhaps they don’t want to overload Dennis with orders? I can’t say, but I am absolutely enjoying mine and can confidently say that it took my appreciation of the hobby to the next level ten months ago.